One of my section sergeants received a jersey from his father about a month ago. On a trip to Baghdad into the Green Zone, we stopped by and took a few photos by the Iraq-Iran War Memorial. SSG Mark Kingsley thought you all would love to know that the Bulls have fans all over the world. Hope you all like the pic. ...and Sergeant Palmer, please know that you and your fellow soldiers have fans in Durham, NC! 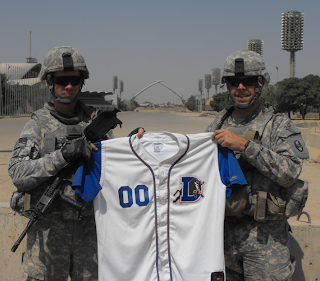 The Durham Bulls honor your commitment, sacrifice and courage.